Octavia news, history, model year changes, technical data, used and new car buying tips, do it yourself repairs and more! What information encoded in 17-character VIN number of Škoda models? Do you think your car's VIN number is just a bunch of characters making no sense at all? You're wrong! Car manufatcturers must use a special code format to identify their cars. It must be 17-character long, must contain a check code showing the validity of the whole VIN code, they have to encode the home continent, home country of the company, and the code of the company itself. 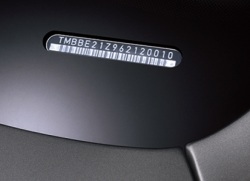 The last 6 characters usually make a serial number, the unique ID of each car. trim level, body outfit, engine type, number of airbags installed, wheel driving mode, model ID, check code of VIN validity, (model)year of manufacture, code of the manufacturing plant. Type your car's VIN into the box below, press "Search" and see the details of your car! I will not store or use your VIN number for any reason! If you don't believe me, you have the right NOT to type your VIN! Last update: 04. Feb., 2013.